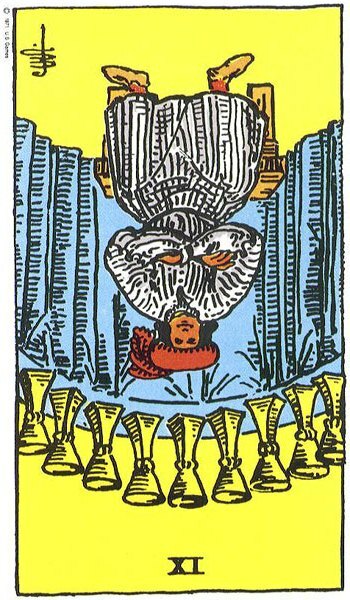 The emotional intensity of the last few days is almost played out, at least for now (Nine of Cups, reversed). Those cups full of feelings are almost dry — if you have reacted to this emotional/intuitive flood by crying a lot, you may find that you are now just about cried out. The flood begins to ebb and calm and balance begin to return. That means that now, finally, you may have it in you to bring your heartfelt feelings and dreams, as well as your spiritual aspirations, into your daily life. You are coming down to earth, so to speak. Apply what you have learned from the last few days in a calm and grounded way, taking the time to organize and plan (The Hierophant). 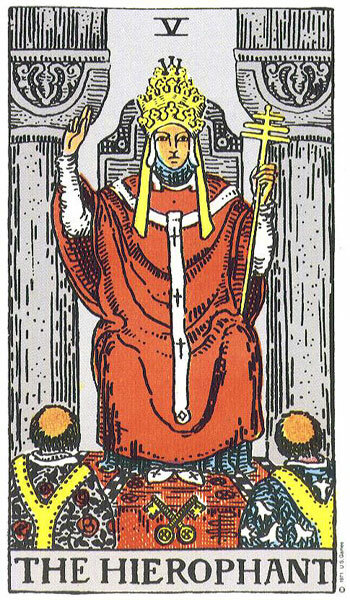 The Hierophant is a major arcana card and today is a day when the energy in the Universe should be with you as you structure your own personal institutions (your family life, your home, your business, your activities). As the emotional flood abates, you will be able to better focus on these things. Think about what kind of organizational structure and material support would be needed to make your most heartfelt dreams and aspirations a reality. Set goals and plan how you will achieve them. Previous Cards for the Day: R’d Page of Cups/R’d Knight of Wands: Overwhelmed by Sudden Intuition? Ground.